Diamond Essence Ear studs, 0.75 carat each, set in 14K Gold Vermeil prongs settings, 1.50 Cts.T.W. Diamond Essence Ear studs, 0.75 carat each, set in Platinum Plated Sterling Silver prongs settings, 1.50 Cts.T.W. Silver, Artistically Curved Tension Setting, 3.0 Cts. T.W. Diamond Essence 1.50 Cts. each, Round Brilliant Stone Set in Platinum Plated Sterling Silver, Artistically Curved Tension Setting, 3.0 Cts. T.W. Designer Pendant With Ruby Essence Asscher cut stone in four prongs setting and surrounded by Diamond Essence Melee,1.50 Cts.T.W. in Platinum Plated Sterling Silver. FOR MATCHING EARRINGS ITEM# SEC3048R. Designer Stud Earrings with 0.75 Ct. each, Cushion Cut Blue Topaz in Melee set four prongs, 1.58 Cts.T.W. in Platinum Plated Sterling Silver. Diamond Essence Pendant with 2 Cts. Morganite Stone and Brilliant Melee, set in Rose Plated Sterling Silver Halo Setting. Approx size of Pendant is 18 mm Length and 9 mm Width. Diamond Essence Cross Pendant With Round Brilliant Stone Set In Four Prong Setting, 0.50 Ct.T.W. In Platunum Plated Sterling Silver. Approx Size Of Pendant Is 27.50mm Length And 19.50mm Width. Diamond Essence Ear studs, 0.75 carat each, set in 14K White Gold-four prongs settings, 1.50 Cts.T.W. Diamond Essence Sterling Silver Antiqued Peridot Earrings. 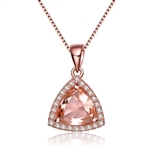 Diamond Essence Pendant in Sterling Silver Rose Gold-plated 24mm length an width with 0.01 ct. Diamond Essence Melee. Cross Design Family Heart. Diamond Essence Halo Setting Platinum Plated Sterling Silver Earrings, with 1 Ct. each Pink Essence surrounded by Brilliant Melee, 2.25 Cts.T.W. Diamond Essence Halo Setting Platinum Plated Sterling Silver Earrings, with 1 Ct. each Ruby Essence surrounded by Brilliant Melee, 2.25 Cts.T.W. Diamond Essence Blue Topaz Halo Earrings Set in Platinum Plated Sterling Silver, with 1 Ct. each Blue Topaz Essence surrounded by Brilliant Melee, 2.25 Cts.T.W. Designer Stud Earrings With 1 Cts.T.W. Ruby Essence Asscher cut stone in four prongs setting and surrounded by Diamond Essence melee,3 Cts.T.W. in Platinum Plated Sterling Silver. Diamond Essence Twist Ring With 1Ct. Each Round Brilliant Stones, 2.0 Cts.T.W. In Platinum Plated Sterling Silver. Diamond Essence Two Tone Solitaire Ring With 1 Ct. Round Brilliant Stone In Platinum Plated Sterling Silver. Diamond Essence Pendant With Marquise Essence Center Escorted By Two Rows Of Round Brilliant Melee, 1.60 Cts.T.W. In Platinum Plated Sterling Silver. Approx Size Of Pendant Is 26.5mm Length And 10mm Width. Bamboo ring. An unusually beautiful ring with spikes of Gold Vermeil surrounding a dazzling 3.0 carat marquise cut Dimond Essence. 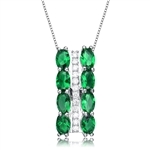 Diamond Essence Halo Setting Platinum Plated Sterling Silver Pendant, With 4 Cts. Pear cut Sapphire Essence surrounded By Brilliant Melee, 4.25 Cts.T.W. Approx Size Of Pendant Is 25 mm Length And 13 mm Width. Diamond Essence Two-Tone Heart In Heart Pendant With Beautifully Channel Set Round Brilliant Stones, 1 Ct.T.W. In Platinum Plated Sterling Silver. Approx Size Of Pendant Is 21 mm Length And 21 mm Width. Diamond Essence 3 Cts. Asscher Cut Pendant In Rose Plated Sterling Silver. Length Of Pendant is 8 mm and Width is 8 mm. Diamond Essence Pendant With Trilliant Stone Surrounded By Melee In Rose Plated Sterling Silver. Length Of Pendant is 18.36 mm and Width is 12 mm. 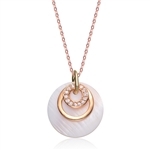 Diamond Essence Mother Of Pearl Pendant With Round Brilliant Melee In 14K Gold Vermeil. Diamond Essence Rose plated over Sterling Silver Designer Earring, 2,0 Cts.t.w. Platinum Plated Sterling Silver Sensational 2.0 Cts. Pear Cut Diamond Essence Stone is flanked by Diamond Essence Melee, 2.30 Cts.T.W. Bamboo Ring - An Unusually Beautiful Solitaire Ring With Spikes of Platinum Plated Sterling Silver surrounding a dazzling 3 Cts. Marquise Cut Diamond Essence Stone. Diamond Essence Heart Journey Necklace, showing off round brilliant stones set in graduating size, 1.5 cts.t.w. on 18" long Gold Vermeil chain. Approx Size Of Pendant Is 23 mm Length And 23 mm Width. Diamond Essence Platinum Plated Sterling Silver Stud Earrings 0.50 Ct. Each, with Sapphire Essence set in Jackets, 2.60 Cts.T.W. For Emerald Essence Item # SEC167JE. 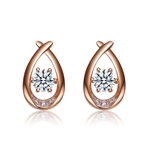 Essence Two in One Style Earrings, can wear as stud or Dangle, 0.75 Ct.T.W. In Platinum Plated Sterling Silver. Platinum Plated Sterling Silver Diamond Essence Valentine Heart Pendant With Heart Shape Ruby Essence Graduating Stones, 1.75 Cts.T.W. Approx Size Of Pendant Is 21 mm Length And 7 mm Width.